Kinetic Fountains has today announced tips for preparing a home’s landscaping for the arrival of spring, including the use of garden fountains. Kinetic Fountains, an innovative leader in high quality indoor and outdoor fountains, has today announced important tips for welcoming spring. All around the nation, the weather is turning warmer and trees are beginning to bud. For most homeowners, it’s time to prepare for spring. That means getting the landscaping prepared for use is one of the top priorities for people. Kinetic Fountains understands the importance of getting ready for spring, and offers several key tips for homeowners. One of the most important things for homeowners to do before things warm up too much is to fertilize all perennials. Both shrubs and perennial bulbs need to be fertilized, and a layer of mulch should be added to beds in the garden. Leaf and branch cleanup is another important step of preparing outdoor areas for warmer weather. Clean leaves and other debris from grass and garden beds before fertilizing or mulching. It’s also important to prune roses and other shrubs in later winter or very early spring to encourage new growth during the year. Irrigation systems should be checked for proper operation, including valve function, leak detection and sprinkler blockage. Of course, trees should also be trimmed to help ensure healthy growth during the new year. Finally, garden fountains can also make excellent additions to landscaping and they can be used to help pull a design together, creating a unique outdoor area. 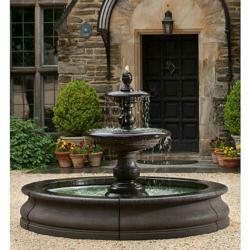 Whether designing a formal garden or a casual spot for relaxing in the warm spring sunshine, Kinetic Fountains offers a full range of outdoor fountains, from stone garden fountains to urns and vases, bamboo fountains, brass garden fountains and more. Kinetic Fountains offers a broad range of styles, from whimsical frogs and butterflies to Victorian themed outdoor fountains and even Greco-Roman garden fountains. To find out more about the various outdoor garden fountains on offer or to place an order, visit the company at http://www.KineticFountains.com. About Kinetic Fountains: Kinetic Fountains is located in the stunning Blue Ridge Mountains in North Carolina. The company is dedicated to giving customers the means to enjoy the incomparable beauty of nature and the health benefits offered by running water in the form of indoor fountains, outdoor fountains, logoed fountains and more.